You'll be £6.00 closer to your next £10.00 credit when you purchase Tracing Your Welsh Ancestors. What's this? Few previous publications have focused on Welsh family history, and none have provided a comprehensive guide to the genealogical information available and where to find it. That is why the publication of Beryl Evans's new Welsh family history handbook is such a significant event in the field. Her detailed, accessible, authoritative guide will be essential reading and reference for anyone who is eager to research ancestors from Wales. She describes the key archival sources and shows how the development of new technology, the internet in particular, has made them so much easier to explore. Drawing on her long experience of family history work, she gives clear practical advice on how to start a research project, and she sketches in the outlines of Welsh history, Welsh surnames and place-names and the Welsh language. But the main body of her book is devoted to identifying the variety of sources researchers can consult – the archive repositories, including The National Library of Wales, civil records of all kinds, the census, parish registers, wills, the records of churches, chapels, schools, businesses, tax offices and courts, and the wide range of printed records. Beryl Evans's handbook will be a basic text for researchers of Welsh descent and for anyone who is keen to learn about Welsh history. This detailed but easy to use guide will be essential reading for anyone anxious to research ancestors from Wales. 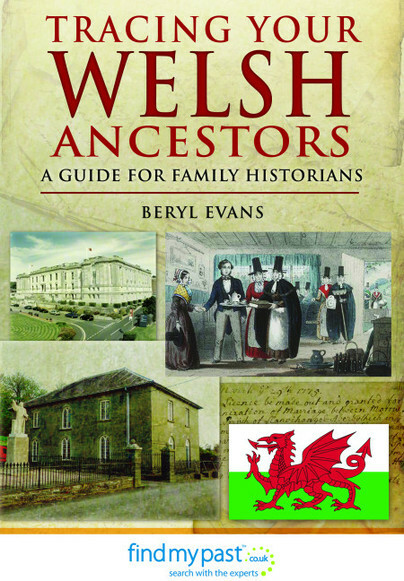 This is a detailed, accessible and authoritative guide to researching Welsh ancestors. ... A most useful volume. A comprehensive guide to following a paper trail that's more tricky than most out there. Beryl Evans is Research Services Manager at the National Library of Wales in Aberystwyth and has been researching Welsh family history for thirty years. She is a member of the executive committees of the Federation of Family History Societies and the Association of Family History Societies of Wales, and she is chairman of the Cardiganshire Family History Society. She has contributed to television and radio programmes on family history and to magazines and journals in the field.